Took a little bit of a break from posting my Nubar duochromes... But here's another one that I love a whole lot. Only a few more left to post! Nubar Moon Shadow. This is one amazing looking multichrome polish. It starts off purple but then flashes through a range of colors. Bronze, red, orange, gold, green. Really, really cool. 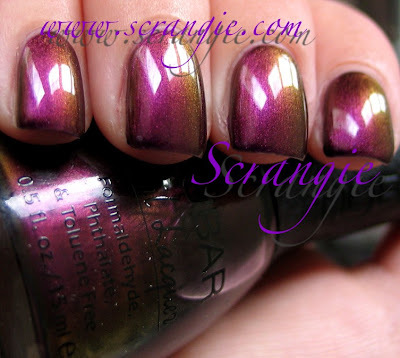 Last time I was on Nubar's website I didn't see this listed, but I did see a polish called Moon Eclipse that looked kinda similar... I don't have that one. Anyone know if they did a little name change, or if Moon Eclipse is a completely different polish altogether? Want! I hope that Moon Eclipse is the same, because this is stunning! I love this! Even if it wasn't multichrome the purple base is amazing! Omg! Everytime you post another nubar duochrome, I feel like I need to have all of them lol! I love how you take a lot of pics to capture all the different colors. Amazing. The gorgeous shut my brain down. All I can do is stare and drool. TheNailAddict, thanks so much for confirming! Scrangie, you have made me fall in love with my Nubar mulitcromes/duocromes again. Thank you! I saw this post and ran over to Amazon and ordered this polish. You are an evil, evil enabler. *dies* I've never seen this one! Great polish, great pictures, Scrangie!!! There is Nubar Moon Shadow at feelunique yet, I bought mine there. I bought it (the Moon Eclipse version) a few weeks ago and LOVE it! I went to Nubar site with the intention of buying Moonshadow. All they had was Moon Eclipse. Wonder how close the two are? Anybody know?? "Breathtaking! I love it! And it reminds me of the Cat Steven's song (can't help it, such a beautiful song). :D" ditto! I was singing Moonshadow in my mind. Cat Stevens was adorable. Beautiful polish. I don't have this in either name. Damn! This reminds me of one very early OPI special ltd ed the did - was same shades. Seems to me it was out about the same time as Nicole launched possibly - as in same yr. I picked it up - there were as I recall 3 choices and they were in a box that looked similar to today's DS box. I wore it and just was not sure. it looked interesting but was not sure of that odd green that it would come up with. I was so used to 'normal' colors, I had no idea at the time what I was looking at and what I HAD in my collection. This Nubar is pretty darn amazing - just looks like the formula is perfect as well as being gorgeous! p.s. I bought it as Moon Eclipse and yes it appears to be the same (as others before my have verified). I used this polish (3 coats) and topped it with Essie Shine of the times (1 coat). You're going to have to see that one for yourself, it's amazing. I honestly said "whoa"!